BRINSTON—Wind turbines tear apart communities and relationships, causing animosity that lingers for years, warn farmers who have lived through the ugly battles. Don Winslow signed up almost immediately in 2013 when a wind company planned to build five turbines near Peterborough. Three months later, after immense public pressure and hostility, he couldn’t do it anymore. There are only three wind turbine projects in Eastern Ontario – Brinston (10 turbines), Wolfe Island (86 turbines) and 5 turbines just west of Kingston, but there are more than 1,200 turbines in the province with another 1,500 on the way. The province is expected to announce new projects this month that could include another 98 turbines in Eastern and East-Central Ontario. 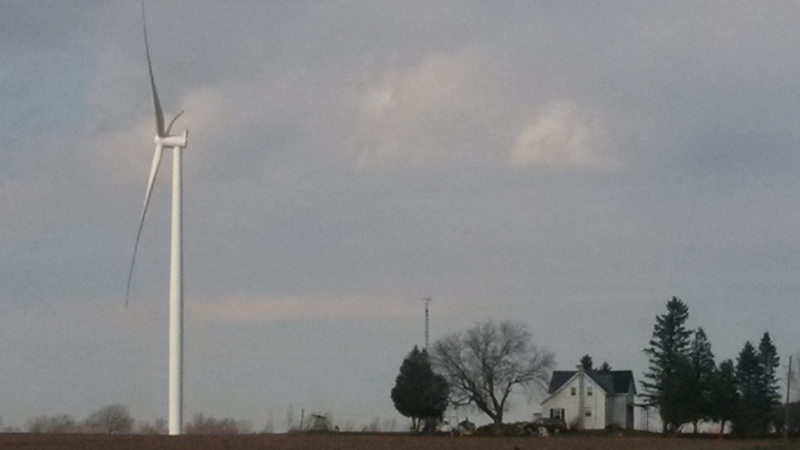 Most turbines are in Western Ontario where the stories are shocking. … But not everyone blames wind turbines. Some lay the blame on anti-wind protestors for stoking fears and fueling the fighting. Farmers with turbines have signed confidentiality agreements and won’t speak to news media. However, North Gower farmer Ed Schouten signed up for turbines on his dairy farm years ago but the project never went ahead. Although he is a strong supporter, Schouten said he would have to think long and hard about signing up again if the opportunity arose. Schouten credited anti-wind groups for doing a good job of fear-mongering and, while they are a minority, get people riled up. To see the full article, go the FarmersForum.com next week or call 613-247-1334 to purchase a copy. *Ottawa Wind Concerns Editor note: during the time of community action to oppose the proposed North Gower-Richmond wind power project, there was NEVER any threats of violence or civil disobedience. As to the comments about the opposition being a “minority,” readers will recall that a petition to the City of Ottawa requesting that North Gower be Not A Willing Host to the wind power project garnered signatures from 1,400 residents— almost every taxpayer in Ward 21. The petition was accepted and a motion of support passed unanimously at Ottawa City Council. When I see the tweet from Scott Luft today saying ‘Samsung K2 Project made IWT supply in Bruce zone-worthless shown by my summary data” and I know the grief that this project has brought to marriages, families, friends and neighbours, it makes me so sad that Premier Wynne and Minister Chiarelli refuse to make the necessary changes and continue to allow this ridiculous situation to go on. What a nightmare this has been and still is! How will we ever heal the damage this project has caused? See the comments in this article: how can you rebuild trust when your neighbor chose money over your community — and you?